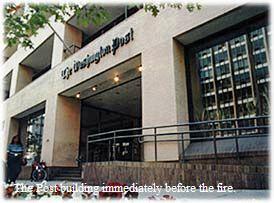 Angered by a cartoon mocking President George W. Bush, a mob of unruly Republicans surrounded and set fire to the office building that houses The Washington Post. The Republican crowd made for a striking sight, with men clad in suits and ties and women dressed in simple skirts with modest blouses and blazers. They had gathered in early morning at the Post’s main offices on 15th Street, NW, following publication of a cartoon that clearly belittled the President. After receiving word that the cartoon had been reprinted in newspapers all over the country, the mob grew restive and, towards mid-day, ignited the building using kiln-dried fatwood kindling from Restoration Hardware and scented candles purchased from a nearby Crabtree & Evelyn. “George Bush is a great man and this is simply another transparent effort by the liberal media to destroy our nation,” said one bejeweled GOP matron. A man wearing a silk bow tie called for a boycott of all newspapers as well as the products -- trees, paper, ink, computers and trucks -- used to print and distribute them, a demand the assembled mob greeted with cheers and cries of "Huzzah!" As Republicans from states as far away as California booked private jets into the nation's capital to join in the protest, political leaders appealed for calm. “My friends, no one of course can countenance any insult directed at our politicians," said US Senator John Kerry, the Democratic nominee for president in 2004, "Yet there is a right way and a wrong way to express our displeasure. And I am certain that even though divided we as Americans can be united, whether poor or rich, soldier or general…” Meanwhile, as Kerry was speaking, cartoonists across the country were hastily backtracking, with many of them apologizing for past portraits of the nation's leader. "I promise never again be misled by the heathen lure of pen and ink," said one syndicated cartoonist.